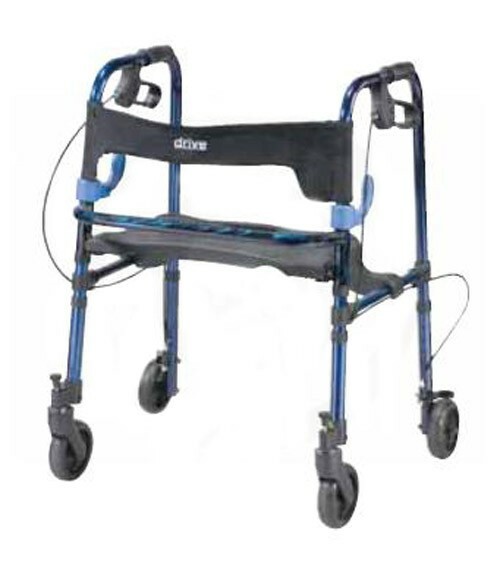 Drive Medical's Clever-Lite Rollator Walker is the perfect mobility aid to get you moving. 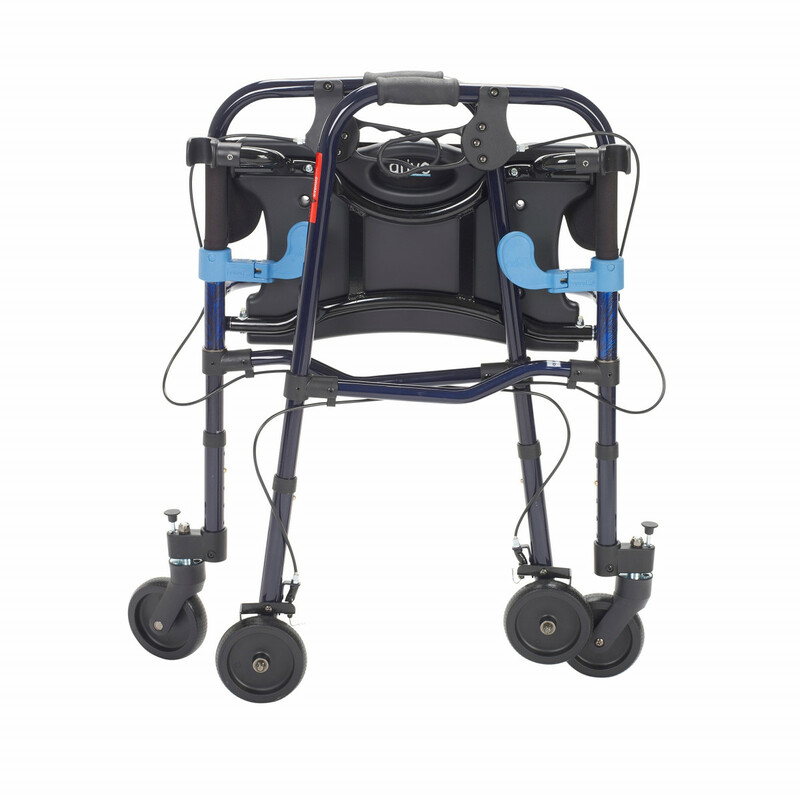 Indoors or out, this rollator will be the best choice for all your essential needs and more. 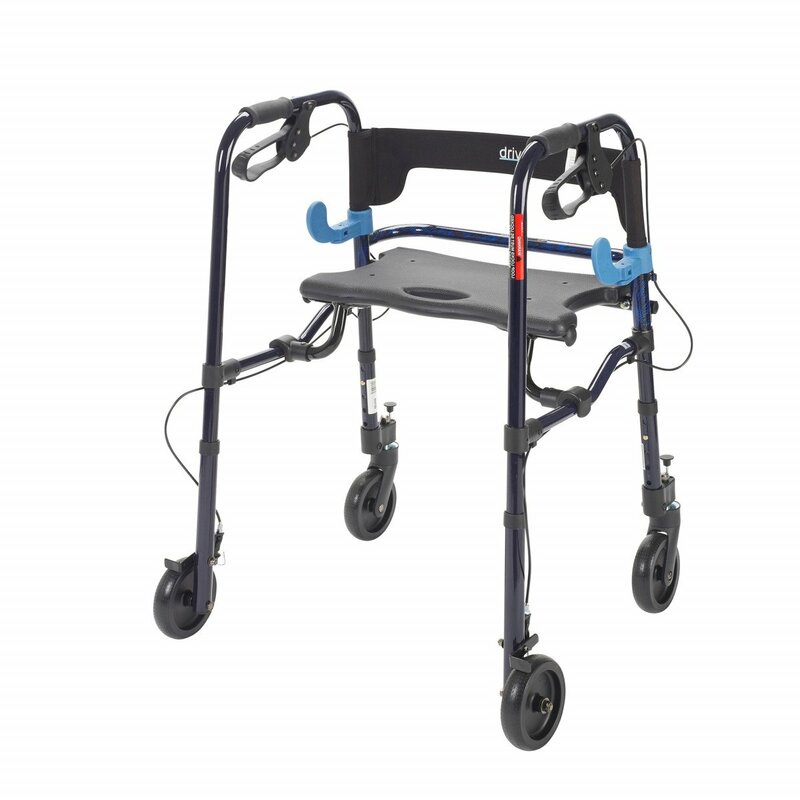 Every solid rollator begins at the base, and the Clever-Lite is no different. 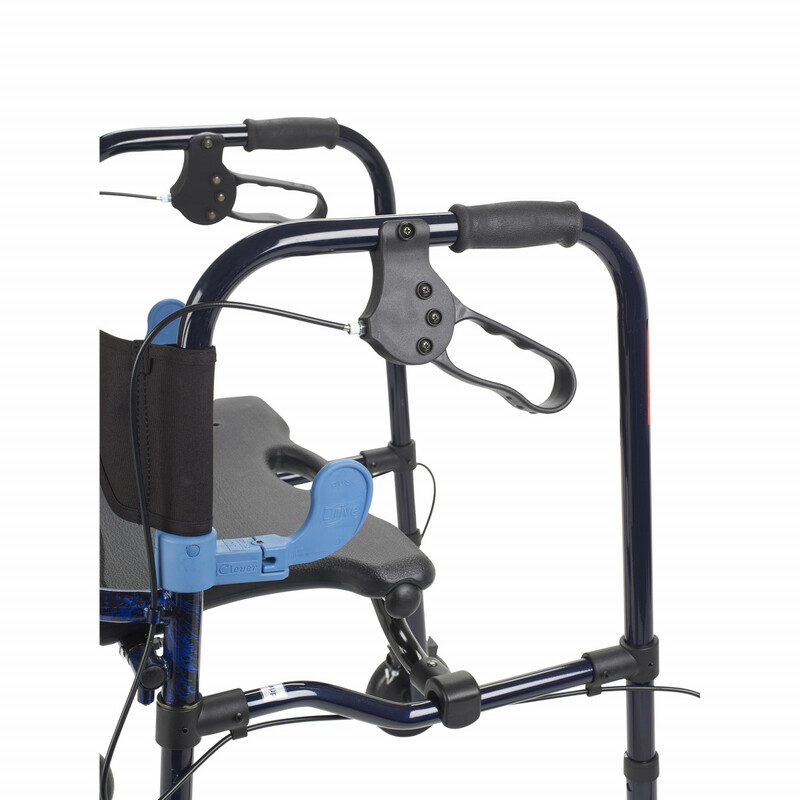 With four wheels and an option to either swivel or fix the front casters, you'll be able to move in any direction at the flick of a switch. 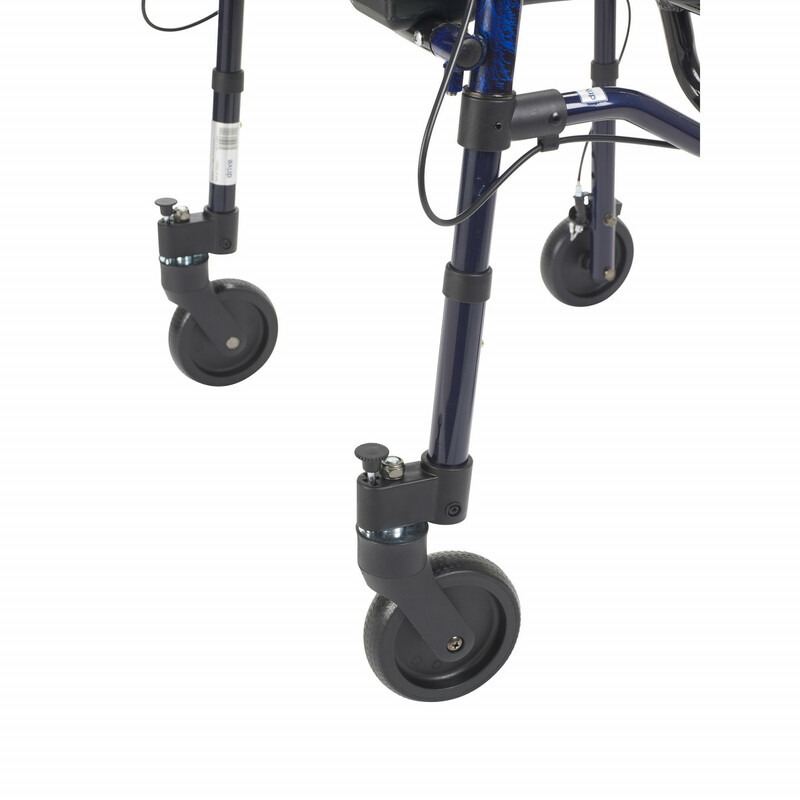 The brakes conveniently and discreetly tuck around the perimeter of the walker and attaches to the rear wheels. Simple pull handles give you the ability to stop at any moment without being thrust forward. The body is reinforced with sturdy, one-inch diameter aluminum that's able to elongate the lifetime of the product. The sturdy design is able to support up to 300 pounds without compromising the design. For extra convenience, the seating area flips upward and has a built-in carry handle for easy storing. The seat itself is 18 inches wide, providing plenty of sitting space. The handles are height adjustable up to 36.5 inches, allowing a person up to 6-feet, 5-inches tall to use the rollator without having to lean in too far. It's also lightweight weighing only 14 pounds, for easier lifting and storage. Depth (opened at base): 24"
What is the weight of the adult walker model DRV10230 and junior model DRV 10230J? The weight of the adult model is 9 pounds. The weight of the junior model is 8 pounds. I would like to know which size would be better for a 85 year old female 5'1" and maybe 130 lbs? Basket dimensions are not immediately available. We have contacted the manufacturer for specific information. The DRV10230 product description says it weights 14 pounds but the adult product specification says it weighs 9 pounds. Which is it? The product weight is 9 pounds according to the manufacturer. I have a Invacare Rollite Rollator Walker ; I wish to replace the black seat, it cracked. The model # is 65100JR, adult size. I have had it for over 2 years and really depend on it. What is the cost for the replacement seat? Since the item is under a limited lifetime warranty we may be able to assist you in getting a replacement seat. Please contact customer care at 800-397-5899 and speak with a customer service representative who should be able to assist you. Is there a dealer near me (zip code 33844) that I could try this without having to pay shipping to return if it is not what I want? Also, how does the basket work? We do not have any store locations outside of Salt Lake City, Utah. The basket can be affixed to either side of the rollator to store items. How much does it weigh and what is the weight restriction? The product weight and weight capacity are both listed in the specifications section of this page. 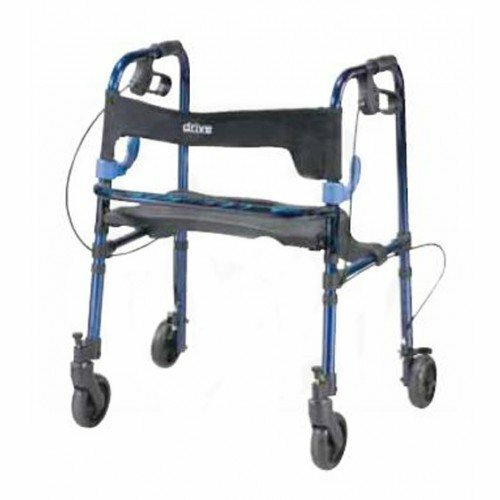 This walker is sturdy, folds easily and provides a seat for when I am worn out. I especially am fond of the fact that is folds nearly flat so I can fit it between my driver's seat and the back seat with no problem. I took my old one just like this on a trip to Hawaii and it survived rough airline handling like a charm! The wheels are also fabulous, I call it my "all terrain walker" because I have taken it to the hills, to the beach and everywhere in between with no problem. Wonderful service and for the model I bought about $100 cheaper than Amazon !!! I like the rollator. It is what I needed for my height and to get in and out of cars more easy. It is a little wobbly and I wish the wheels were not plastic but it is really better than what I had. It is also lighter weight which is probably due to the plastic wheels. Over all, I really like it. Using the walker rollator as mobility aid has helped a lot. I need not to worry when I move around as looplocks are integrated. When I am sitting, the comfort is there as it provides a flexible and soft backrest. I can easily manipulate the walker to my desired position. I am secured that this product is durable and safe.